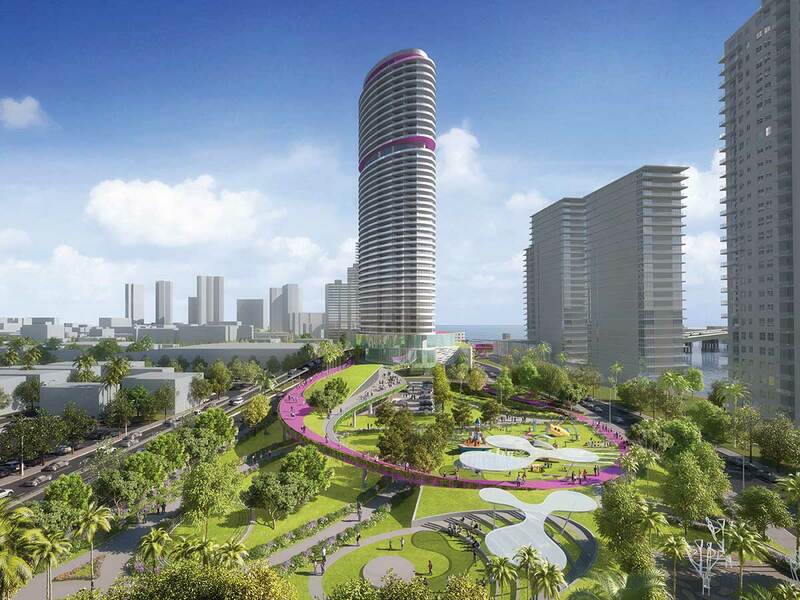 The Alton Gateway developers have proposed changes in their original plans for the condominium tower, park and retail off the MacArthur Causeway entrance to Miami Beach. The amendments passed a first reading this month and are due a final vote in April. The Alton Gateway Development is to bring a luxury condo, three-acre park and retail behind Bentley Bay Condominiums and the Floridian. The development spans three lots, including the exposed bones of the South Shore Hospital at 630 Alton Road that is being demolished after sitting empty for over a decade. The proposal presented in mid-March to city commissioners outlines several changes. The first scales up the commercial building from 25 feet tall to 40 feet. The changes abide by the zoning code, which permits commercial buildings to rise up to 60 feet. The second change focuses on reducing the setback of cleared pedestrian pathways and elevated pathways south of Sixth Street for 5 feet on Alton, MacArthur Causeway and West Avenue. For example, the minimum setback for pedestrian walkways would go from 20 feet to 17 along the MacArthur Causeway to allow for access lanes. The third change would modify the latitudes for areas in the clear pedestrian path adjacent to the new structures. The city planning board worries it might be too limited to accommodate trees, and can be problematic with the Florida Department of Transportation’s requirements for setback space including trees. City officials working alongside developers emphasized encouraging the public to use elevated pathways rather than sidewalks near the project for safety concerns. Modified design plans, they said, can encourage the public to opt for elevated walkways. City officials reassured her that regardless, street-level access remains for pedestrians who prefer not to use the elevated pathway. The action passed on its first reading. Commissioners are to review the final amendment proposals during the next Miami Beach city commission meeting April 10.